MANILA, Philippines - The 300th death anniversary of St. Louis De Montfort is worth commemorating. The Montfortian Family in the Philippines, namely: Montfort Missionaries, Daughters of Wisdom, the Brothers of Saint Gabriel and Associates combined all efforts to set out a three day program to make known this great Marian Saint and his spirituality. This Triduum was dubbed as “A Marian Journey with Saint Louis Marie de Montfort”. Montfort’s wisdom saying, “It was through the Blessed Virgin Mary that Jesus Christ came into the world and it is also through her that he must reign in the world”, moved all even more with zeal, as they went on with their mission. The theme “Burning Love for God Alone” captured this response and challenge to all Montfortians in the Philippines. 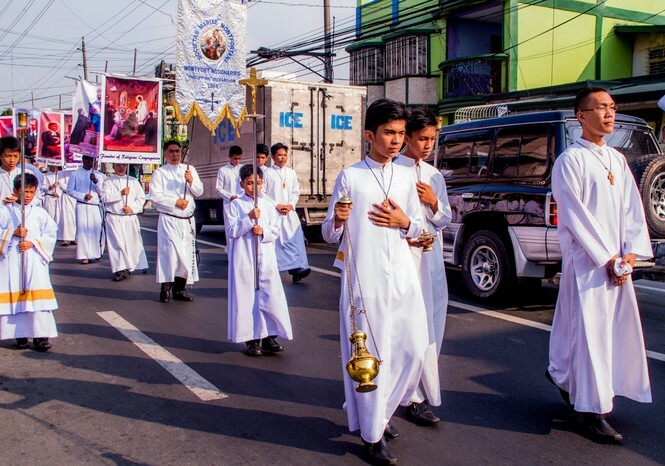 First activity was on Montforts’ feast day, April 28, 2016, a procession was held at the Saint Therese Parish, parading both Montfort and Blessed Marie Louise that shows the inseparability of the two. Seminarians carried with them pictures depicting the different descriptions of Montfort. This was followed by the Celebration of the Eucharist presided by Most Reverend Bishop Ernesto Delgado, D.D. Bishop Emeritus of the Archdiocese of Nueva Segovia. And then, a very festive reception called “Barrio Fiesta” was held after the mass. It showcased different folk dances of the Philippines, traditional games and local food. The second activity was a Marian Conference that was held at the University of Makati Theatre on April 29, 2016. It was the main event for Montfort’s tribute and a way to spread the wisdom of Montfort. The effort poured on this event was nothing but the best from the main speaker, Fr. Mario Belotti, SMM. He in a very special way brought the assembly to the knowledge of who St. Louis de Montfort is, translated in his language of love for both the Saint and the pilgrims. The talk once again has proven St. Louis de Montfort as a passionate lover of Mary. His very own Marian journey brought himself to the burning love for God alone! This event was made possible through the cooperation with the University of Makati Catholic Campus Ministry. Third, a pilgrimage was held on April 30, 2016, visiting five Marian churches in Manila namely: Our Lady of the Holy Rosary La Naval de Manila, National Shrine of Our Lady of Lourdes, Cathedral of the Immaculate Conception, Archdiocesan Shrine of Nuestra Senora de Guia and Our Mother of Perpetual Help National Shrine. Typical in the pilgrimage were the Little Crown of the Blessed Virgin Mary and Holy Rosary said while in the bus. Intersperse in the prayers are Marian songs led by the seminarians. The celebration of the Holy Eucharist was at the first stop, Our Lady of La Naval or Sto. Domingo church, which was presided by Fr. Richard Magararu, SMM. The pilgrimage’s highlight was paying homage to the Icon of the Perpetual Help in the famous Shrine in Baclaran. It ended with a sharing of the experiences of each pilgrim before departing for home.